Surprise: New York Democrats Like the Democratic Party! And the Sanders campaign is making enemies with its attacks. When Hillary Clinton beats Senator Bernie Sanders in New York on Tuesday, which she is widely expected to do, a big part of the story will be a phenomenon I haven’t seen in the other four primary/caucus states I’ve covered this year (all of which, as it happens, Clinton has won): Many New York Democrats do not appreciate the Sanders campaign’s attacks on their party. And they really don’t like his supporters’ disruptions at Clinton rallies. I’ve been to a total of five Clinton events in Brooklyn, Washington Heights, and the Bronx in the last few weeks, and I can say conclusively: The biggest applause lines always have to do with Sanders’s recent status as a Democrat, and Clinton’s long history with the party. At all of these events, Clinton surrounded herself with local Democratic leaders, while Sanders has generally been promoted at his much larger New York rallies by a combination of grassroots activists and celebrities, not by local elected officials. To lefties convinced that such folks are corrupt post-Tammany hacks, this is no doubt a selling point for Sanders. But for ordinary people who consider themselves Democrats—and I’ve met a multiracial throng of avid Democrats who are home health workers, nannies, bus drivers, teachers, waiters, social workers, and museum administrators at Clinton rallies—it is part of why he will lose on Tuesday, and perhaps lose big. But Sanders drew an estimated 18,000 to that Bronx rally. And on the very night Clinton attracted about 1,000 people to Co-op City—a few hundred were turned away—Sanders drew somewhere between 11,000 and 26,000 to Washington Square Park. But while Sanders’s crowds are much larger, the enthusiasm of attendees at Clinton rallies is comparable. A young black woman standing next to me, wearing multiple Clinton buttons, chanted, “We don’t need no BS!” In front of me, an older Latina stood on tiptoes trying to get a photo with her phone, and yelled “Hillary!” every few minutes. At a rally in Washington Heights on Sunday, Clinton supporters mixed it up with Sanders backers who came to disrupt what was billed as a “block party” to get out the vote in this heavily Latino neighborhood. 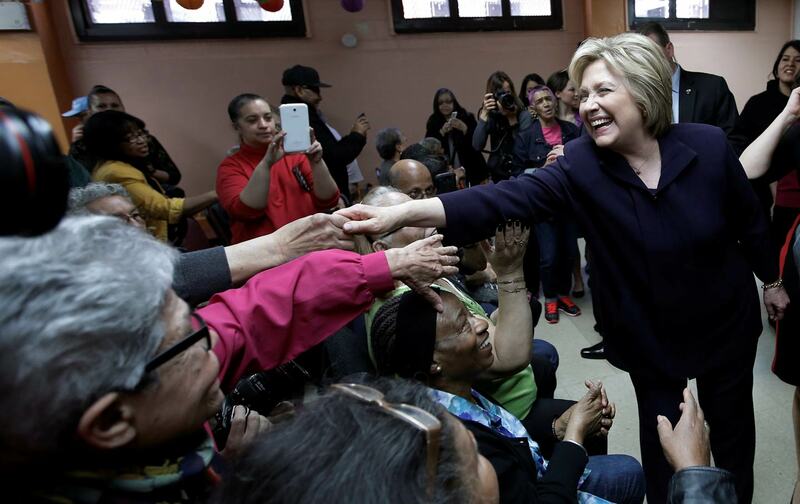 Clinton surprised the crowd with a short unscheduled performance, at which she briefly danced to Latin music with State Senator Adriano Espaillat, thrilling the audience (though haters would predictably hate online later.) Meanwhile, a young white woman carrying a “Unidos Con Bernie” sign pushed through the crowd, jostling the older Latinas who were crushing the stage to get closer to Clinton, chanting at them, bewilderingly, “Shame, shame, shame.” It was not a good look. After Clinton left, and her supporters dissipated in her wake, the Sanders backers got noisier—and they got a lot of clap-back from black and Latino neighborhood Democrats who stood around to challenge their views. McLaughlin jumped in: “Do you know her record on healthcare? Or on immigration? I’m an immigrant!” She is wearing a jaunty beige fedora in the hot sun, and she turns out to be tireless in engaging the Sanders supporters. A young (but older than Justin) female Sanders supporter with a “Bernie para presidente” T-shirt joined the circle and started screaming at Dear and McLaughlin. “Hillary didn’t just vote for the Iraq war—she promoted it state to state for George W. Bush! She traveled around the country to sell it!” Dear, calmly, tells her that isn’t true—or at least, no one has ever reported that news—and the Sanders supporter starts pointing her finger in the older woman’s face. “It is true! George Bush has given her credit for that! She spread the hate, because of September 11!” she yells at a higher pitch. “She is not qualified to be commander in chief!” Like the woman who roamed the crowd earlier crying “Shame,” this Sanders supporter was strangely overwrought, seeming near tears. “Bring it down now, bring it down,” Dear told the young woman, who walked away in rage before I could get her name, saying she would vote for Jill Stein. “There’s another party out there,” she warned the older Democrats. Cesar Andrade, Sanders’s Washington Heights organizer, moved in to take up the woman’s argument, but more calmly. “Do you really think Hillary will push for universal healthcare?” he asks the two women, only a little condescendingly. “Do you realize she has pushed for it her entire career?” Dear shot back. “When she was 16!” Dear exclaimed. “Well, it shows her values,” Andrade replied. Justin agrees, asking, “I don’t see why Washington Heights supports her, what has she ever done for this neighborhood?” Now two white women standing on the margin of the discussion jump in to tell him about the funding Clinton got for neighborhood lead abatement programs in the Senate. “Washington Heights had one of the worst lead problems in the country,” local activist Liz Ritter explained. “We used that funding to do a lot of local lead abatement right here in this neighborhood.” The young man was polite, but unimpressed. He shook our hands and walked off into the sunny Sunday afternoon. Meanwhile, as we were talking, tens of thousands of Sanders supporters were amassing in Brooklyn’s Prospect Park. I thought of Dewayne Phillips’s remark that night in the Bronx: “Supporters of Bernie love rallies. Supporters of Hillary love to vote.” We’ll see if that’s true for New York on Tuesday.